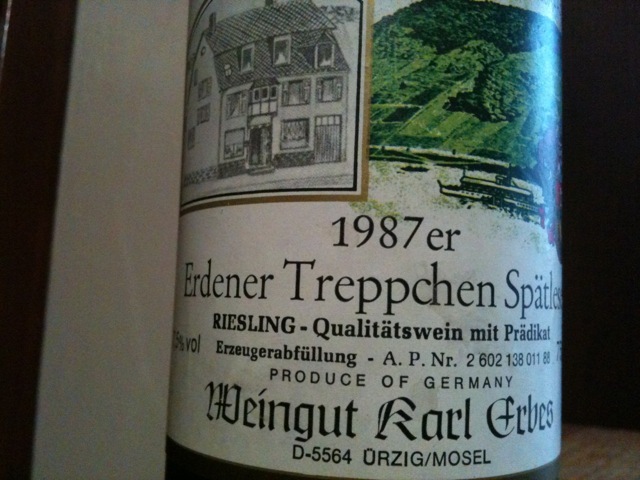 Some of you might remember that one of my early posts on this blog was about the 1987 Vereinigte Hospitien Erdener Treppchen Riesling Spätlese which we had for her birthday last year (see the post here – in an aside, I am just realizing that that post only garnered one like, from my good old blogging buddy Julian at Vinoinlove. Thanks, Julian!!). Back then I explained, that 1987 is considered a weaker year along the Mosel, so it is always a bit of a surprise when the wines held up. Trying the 1987 Karl Erbes Erdener Treppchen Riesling Spätlese was particularly interesting because the wine has pretty much exactly the same properties that the Hospitien wine had: Both from the same vineyard (albeit probably different areas within the vineyard), both 100% Riesling and both at Spätlese level, the medium category in the German wines with distinction level, which means they had comparable levels of ripeness in the grapes as measured in degree Oechsle. The Treppchen borders the Ürziger Würzgarten and Erdener Prälat vineyards, in the photo it begins on the far right hand side. The wine had 7.5% ABV and was made by Stefan Erbes’ father Karl Erbes. One of the many wonderful things about this winery is that they retain a significant number of older vintages at the winery which are for sale. So if you ever make it there, make sure to ask for their older wines, too. They are also quite affordable still. You can find out more about the winery in my post here. But now to the wine: The cork was in perfect condition and I decanted it for about 30 minutes. It poured in a light golden color, with some visible signs of ageing. The initial nose was very unappealing, strong musty aromas, some hints of leather, hardly any other aromas detectable. At that point, I was worried it might be flawed from that nose. On the palate, it was surprisingly fresh. The mustiness was not detectable when I tasted the wine. It was very delicate, and had contracted quite a bit, making it rather thin. It showed a good acidity structure with just a hint of sweetness. There really were no noticeable fruit aromas, I got more petrolly, aged Riesling flavors. A finish of medium length. All in all, this was a bit weird. The nose was definitely not nice and it did not improve when I retasted a day later. The wine tasted still decently, but I thought the Hospitien wine we had last year had held up better. But another year of bottle age can also make a lot of a difference, so it is virtually impossible to compare the wines if you don’t try them on the same day. That said, this wine is most likely on its way out. But hey, it held up for 26 years! And remember, this was “just” a Spätlese, not an Auslese or Beerenauslese. And it was from a vintage that is considered a rather weak vintage…so, absolutely nothing to complain about. The bottle cost us around $16 at the winery, if I remember correctly. I did drink the exact same bottle as part of a larger tasting on saturday and I did not notice any unappealing nose on the bottle. The ’87 Erbes were part of our 5. flight. This could be because it was one of the last bottles in our tasting and we to be frank were getting a bit drunk. But i fully agree on your tasting notes – very, very nice condition. Still very fresh and with load of fruit. Great post as usual and very nice tradition, Oliver! Congrats to your bride (and to you for such a great way to celebrate)! Thanks! And yes, this way of celebrating is awesome. A great set of notes and I am sure a wonderful evening. A Happy Birthday to your charming Bride. A friend gave me a case of 1980s Chards about 2 years ago. No 87s left but I have a couple from 86. We can pop one open to celebrate her conception! Don’t get too excited, though. California Chardonnays aren’t known for lasting that long. Surprisingly they were all drinkable. Some oxidation and most just dropped off within 30 minutes of opening. Really cool seeing the long-term effects. So it’s more of a science experiment than enjoying wine. Oh yeah, we have known that with older Rieslings, too. Still fun, though! What a lovely tradition to open a bottle from 1987 each year! I assume that is her birth year? I think that would be fun to do when/if I have kids. 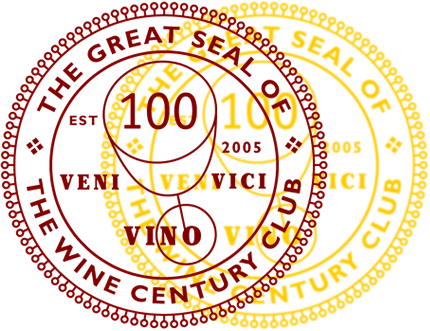 Each year drink a bottle of wine from their birth year to celebrate their birthday.